Enjoy as many cones as you want starting at noon! Ben & Jerry's Free Cone Day is one of those sneaky "holidays" that moves around on us every year. This year, ice cream fans can finally score their free scoop(s) on Tuesday, April 9! The promotion starts at noon, so make sure to have an excuse ready as to why you're getting back so late from lunch. And if you can't break away earlier, the giveaway goes until 8 p.m. at participating scoop shops nationwide. Find the closest one to you here. This year, the ice cream company is upping the ante by offering fans the chance to win up to a year's worth of ice cream if they answer a trivia question correctly. The contest is open until Thursday, April 11. 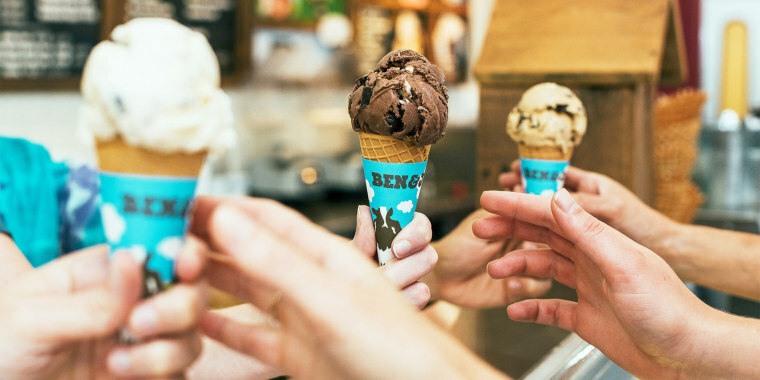 Unlike many other food giveaways and freebie days, Ben & Jerry's Free Cone Day is known for its generous policy that's basically unlimited. Whether you're crazy for Cookie Dough or cheering for Cherry Garcia, if you want to try another flavor, all you have to do is get back in line ... but be warned: Some scoop shops have lines that stretch around several city blocks at peak time. The tradition of Free Cone Day dates all the way back to 1979 as a token of appreciation from the founders after the ice cream maker's first successful year of doing business from a renovated gas station in Burlington, Vermont. "We're nothing without our fans," company CEO Matthew McCarthy said in a prepared statement. "This is one of our favorite days of the year. It's a special tradition, and I can't wait to see all the smiles and happiness Free Cone Day brings. It's all about saying thank you to our fans." Today, the chain says that it gives away more than 1 million free scoops of ice cream around the world on Free Cone Day, easily making it one of the most prolific food holidays of the year.